PHOTO CAPTIONS: 1. The view at night from our hotel window, 2. triple-length buses that actually fill up, 3. bikes are used for deliveries, 4. even though it looks like a successful recycling program, I noticed garbage in all bins. On Saturday, October 20, Andre and I traveled 6 hours west by bus from Sao Paulo to Curitiba. Rio is about 6 or 7 hours the opposite direction. I´d love to see Rio, Bahia, and Manaus, the capitol of the Amazon region, but not sure how we´re going to be able to swing it. Brazil is the third largest country in the world, so we might have to do some flying later on. I chose Curitiba because a former Brazilian ESL student Maria Vaz made a documentary about it called "A Convenient Truth." It was featured in the Pacific Rim Film Festival in Santa Cruz after I´d already left the country, so I didn´t get to see it. 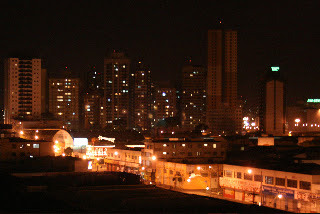 Curitiba, population 1.5 million, is known for being a model environmental city. One thing they did was lower the busfare to encourage people not to drive so much. It seems to be working. 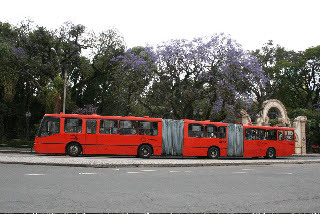 Many of the city buses are 3 buses linked together and they travel around quite full. The city has these cool tubular bus stops to protect passengers from rain. That´s important because Curitiba has a cool climate and even though it´s late spring south of the equator, we´ve encountered quite a bit of rain already in the few days we´ve been here. I´m not as impressed with the recycling program. There are lots of individual color-coded bins for paper, cans, glass, organic, but people seem to throw garbage in all of them. 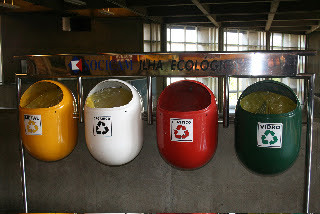 It´s one thing to provide the bins -- another to educate the people. Plus, the trash bins are nowhere near the recycling ones. That´s always problematic. People shouldn´t have to search for the one they need. It seems to work best if they have a mixed recycling bin next to a trash bin. That way people only have to decide between two things. Workers can separate the recyclables later. Our plan for the day is to try to find computer repair for my dead MacBook. I can´t believe how dependent I´ve become on my laptop, especially considering I just got it last summer before Maya and I went to Puerto Rico and Dominican Republic. At the moment I´m in a cyber cafe, using a PC with a foreign keyboard, instead of comfortably in our hotel using free wireless on my MacBook. I don´t have easy access to my photos, addresses, Skype, writings. I have a 3-year extended warranty on my MacBook, but there are no authorized Mac dealers in South America, so I´m not very optimistic about getting it reapired. If anyone knows anyone traveling here from the U.S. in the next month or two, please let me know. I might have to order a new laptop and send this one back for repair. 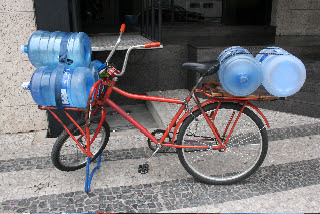 Forget mail service, even though Brazil seems like a first-world country. We also want to go to the consulates for Uruguay and Chile to see about getting visas for Andre. He has a Haitian friend in Buenos Aires who claims they don´t need a visa to enter Chile. That would be great. My cousin Zack lives there with his girlfriend Soraya in Puerto Montt. I also have an assignment to find the biological mother of a friend´s daughter. Detective Chelsea to the rescue! And a Mexican friend Gabriel is studying in Montevideo now. There´s the Juniors World Racquetball Championships in Cochabamba, Bolivia from Dec. 12-20 which we hope to attend. That won´t leave much time to head back to Brazil to catch our Jan. 3 flight to Santo Domingo. But at least we have a rough outline.